Please refer to your deed or call the office before ordering a monument. 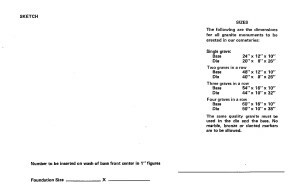 Do not order the incorrect type or incorrect size of monument! WE DO NOT ACCEPT DELIVERY OF MONUMENTS ORDERED FROM THE INTERNET. THE CEMETERY DOES NOT INSTALL MONUMENTS – A MONUMENT DEALER MUST INSTALL YOUR MONUMENT. The cemetery regulates the size of monuments that may be placed on graves. 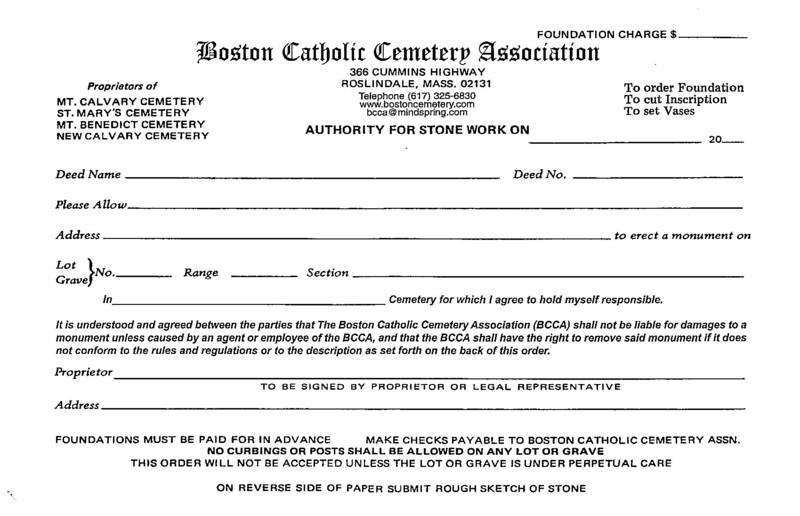 The proprietors of lots or grave(s) shall have the right to erect memorial stones or monuments; but all such structures must be set on suitable foundations, which shall be built by the Boston Catholic Cemetery Association, under the supervision of its Superintendent, and in accordance with the Cemetery Regulations regarding the erection of such structures, and design forms shall be submitted for approval to the Superintendent and his approval shall be obtained before such structure shall be erected. The cost of same to be paid by the proprietor. There are specific dimensions that pertain to the size of the stone which may be erected and those dimensions are regulated by the cemetery. The memorial stone or monument remains the property of the deed owner, who is solely responsible for its maintenance and is likewise solely responsible for any damage and/or personal injury caused by said memorial stone or monument. 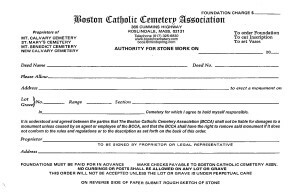 The Boston Catholic Cemetery Association shall retain the right to enter any lot or grave(s) to remove anything it deems objectionable, offensive or improper, in its sole discretion. No tomb shall be constructed or allowed within said lot, unless special permission of the board of Directors and in such a manner they shall direct. No monument may be placed on a grave until the grave it is fully paid for. No monument may be placed on a grave until the monument foundation fee is fully paid. Foundation fees are based on the size of the monument base. All monument bases must have the grave number installed on the top center of the base. 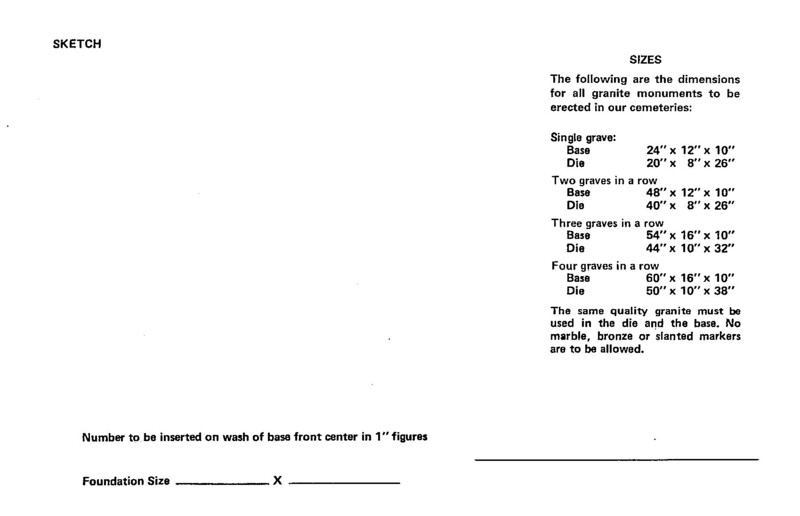 An application to place a monument form (both pages) must accompany each request to set a monument. The foundation fee must accompany each application form. If you are ordering a monument on line please be aware that we do not set monuments. You will need to hire a local dealer to set your monument! Call our office at 617-325-6830 to check that you have the proper size and type before ordering. All monuments must be constructed of granite. NO marble or bronze is allowed. When ordering a monument please make sure there is enough room on the monument for all the names of your future interments. ONLY ONE monument is allowed on a single grave. The only exception is for flat Veteran’s Markers. Veteran’s flat markers are installed at no charge. We only accept flat granite veteran’s markers for installation. NO marble or bronze markers are allowed. No upright veteran’s monuments are allowed. Veteran’s flat markers are installed as time permits. Link to local monument dealers. Please contact a monument dealer for all inscription work.